Your ankle joint is a ‘hinge joint’, meaning it can move up (dorsiflexion) and down (plantarflexion). It is made up of three bones: the lower end of your shin bones (the tibia and fibula), and your heel (the talus bone). Cartilage, a smooth, rubbery coating that acts as your body’s shock absorbers, covers all three bones, keeping the ankle stable and allowing its movements to be smooth and painless. Ankle osteoarthritis (OA) occurs when the cartilage surrounding your tibia, fibula and talus bones wears away, eventually exposing the bone. As the disease progresses, painful bone spurs called osteophytes can form in place of the cartilage. Despite the ankle’s role as a joint that holds a lot of the body’s weight, ankle osteoarthritis is not very common due to the denseness and toughness of the cartilage. In fact, ankle osteoarthritis is 9 times less common than knee OA. 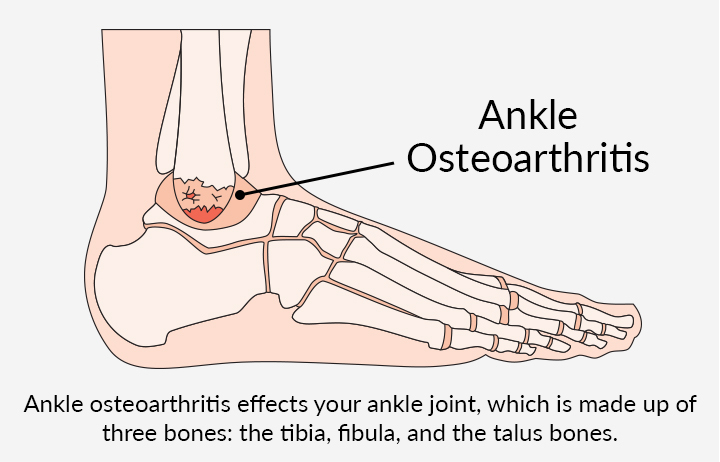 What are the Signs & Symptoms of Ankle Osteoarthritis? The most common symptom of ankle osteoarthritis is a pain in the lower shin, back of the foot, or middle of the foot. Most often, the pain develops slowly over time, but it can appear suddenly. There is no cure for ankle OA, but there are several treatment options that you can follow to help manage your pain and improve your quality of life. Here we’ll explore the most common treatment options, ranging from conservative to invasive. Using assistive devices can help take the strain off of your ankle joint. Studies show that physical activity is a safe and effective treatment for ankle osteoarthritis. Exercise reduces pain as well as improves movement in the joint, balance, and stability. pt Health is the exclusive physiotherapy partner of the Arthritis Society. Learn More about our specialized arthritis and osteoarthritis treatment program. Surgery is the most invasive form of treating ankle osteoarthritis and would be considered by your doctor only if other, more conservative treatments do not provide enough relief from your pain.